Sleep has been proven to be one of the key factors in your optimum health, and yoga, meditation and breathing can be key to improving your sleep health. Because there is simply nothing better than a good night’s rest, we’ve got a 7-Day Challenge with yoga classes for the morning to get you moving and evening classes to help you to relax. 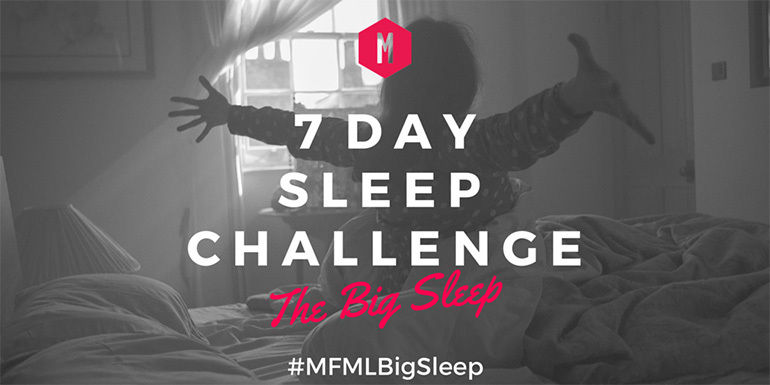 We think that at the end of this challenge your snooze-time is bound to be better. Completely free for MFML subscribers we'd love for you to join us! WANT TO BE GREAT IN BED? This challenge is for you! And for all of us who could do with a better night’s sleep. Let us help you to clean up your sleep routine for good and get some good-quality kip. Your yoga classes will be delivered to your inbox every morning of the challenge together with extra tips and hints to develop your new bedtime routine. These yoga videos have been specially made with your sleep in mind and will top and tail your day to give you the possibility of the best night’s sleep you’ve had in years. Refreshing classes for the morning and relaxing stretch-outs for the evening. Let us ease you into good bedtime habits. Each class is between 25 - 30 minutes long, so it’s easy to plan your new routine. Our classes are with a variety of our teachers so that after the challenge you can go on and practice more with your favourites. As the week goes on you will discover through your daily email everything you need to know for a good night’s sleep. From gratitude to gandha, breathing to bathtime, we’ve got it covered. For the programme, buy yourself a new journal - you’ll need to be keeping a gratitude and fresh-thoughts journal, which is a cornerstone of the programme. You might also want to stock up on some essential oils for your bedtime routine. Choose from lavender, chamomile roman, blue chamomile, frankincense, vetiver marjoram, benzoin, clary sage, vetiver, hops or valerian. Too much choice? We recommend Yogandha Relax, a blend which has been formulated especially for evenings. WHO ARE YOUR SLEEP TUTORS? Our classes feature top UK yoga teachers, Lucy McCarthy, Kirsty Norton, Kate walker, Jean Hall, Andrea Kwiatkowski, Naomi Absalom, Norman Blair and Lisa Sanfilippo. Take our Sleep Challenge and see your mood lift, your energy increase and your productivity soar. Why not challenge a friend or loved one to join you? We want you to feel supported: Let us know how you get on during the challenge and share your journey with us on social media using #MovementForModernLife + #MoveMoreLiveMore. A sweet, nourishing and deeply relaxing sequence to help you drop away tension and stress. Moving through forward folds, this flow class is perfect for those challenged by sleep issues but also great stress release yoga class for practicing anytime. You will need two blocks. A tension freeing practice to help shake off and rinse out blockages and habitual holdings that get in the way of relaxing deeply. Ideal for releasing stress, rinsing out frustrations and emptying out stagnant energy. Perfect for after work and with a long savasana, great for before bed. You'll need an eye-cover. This is yoga to enable you to settle down to sleep, you can even do this practice in bed. Lisa gives you the essential poses and breathing to settle the nervous system ready for rest. She also shares some acupressure points known to help with calming and soothing the body to rest. A very quiet and gentle yoga class. All yoga poses are supine and held for a period, where the body is calmed and quieted and attention is turned inward. Then Norman leads a breath practice at sitting. You may need a cushion or block for sitting still. Great for times where you are looking to reduce stress/anxiety and perfect for before bed when you are looking to quiet the mind and gently stretch the body.